As a person who likes to camp out, no doubt you would have experienced parking on uneven ground. Especially if you go to areas rarely visited by other people, there is a high possibility you won’t be able to park on a leveled area. However, making sure your RV is level is important since many appliances in a motorhome should not be tilted or else they’ll be ruined, like your RV refrigerator for example. Would you rather move your RV to a less desirable area just so it’s on level ground? Of course not; I’m sure you’ll do something to make your RV level enough. But instead of relying on rocks or using your jack, you should use RV leveling blocks. It’s necessary to find the best RV leveling blocks because you wouldn’t want your motorhome to suddenly lose its level when the blocks suddenly fail. As such, we’ve reviewed the top ten RV leveling blocks to give you an idea about the best one for you. A well-known company for RV tools, Camco has proven itself to be a reliable company time and again. I have used other Camco products before, and their leveling blocks are no exception. It is an interlocking type of block, much like how you would use a Lego. However, they don’t completely attach to each other like how a Lego does. The design is just meant to prevent slippage. One pack contains ten pieces, which is good enough for a small RV with single wheels. But if you are using a dual axle RV, make sure to get a second set. It is made of thick plastic that seems durable enough to last a multitude of uses. It has a full base that can handle the load when stacked properly. I noticed, however, that it cracks along the edges when used on gravel, so take care when using this on rocky campsites. I love that it works great on asphalt and doesn’t slip like other levelers. Once you set up your “mini-staircase” for leveling, I would recommend using the Camco wheel chocks that interlock with these leveling blocks. This way, you can be sure your tire won’t slip. What I don’t like about the Camco RV leveling blocks is you can only use up to three stacks or layers (about 4 inches); anything taller than that and the bottom layer will crack and will essentially become useless. Although you can use this for leveling tandem wheel RVs by setting it for one wheel only, your RV will not be stable and might cause the tire to slip from the leveling blocks. Also, check your RV’s weight. These blocks can hold up to 10,000 lbs of full RV weight, so if you go over this, there’s a chance these blocks will break. For the price, the Camco RV blocks are great. 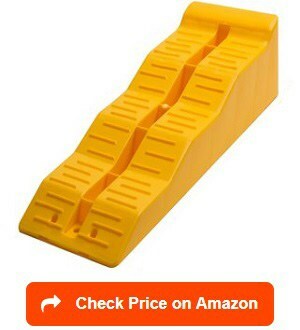 It is two to three times cheaper than other leveling blocks of the same design and material so I would recommend this one. Plus it has its own bag for easy storage, which is always great since you want to be mindful of the space your tools occupy in your RV. The Lynx Levelers work in the same manner as the Camco leveling blocks: it has a modular Lego-like design. However what sets this apart from other levelers, and also my favorite feature, is that Lynx Levelers offer a 10-year warranty! Yes, that’s how confident they are of their product. This also made me confident about trying this leveler out. What I love about these levelers is that they are really very tough. It can withstand up to 40,000 lbs, so you need not worry if you’re using a Class A RV or your motorhome is fully packed. It makes use of an open-cell honeycomb design to be able to withstand the weight. However, because of the honeycomb design, it tends to sink on soft or wet ground. It would be best to bring something like plywood or rubber mats to prevent them from sinking and prevent mud from getting stick inside the honeycomb design. For best results, make sure you stack them like a staircase that you can simply set in place and then roll your van into. For tandem wheels, you would need two sets of these. Each set contains 10 tiles that you can interlock. 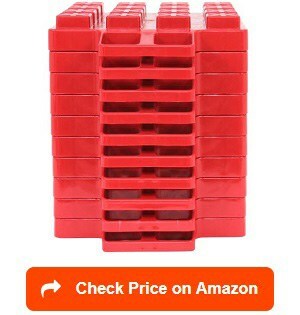 The material of Lynx leveling blocks is of high quality, thick plastic. It doesn’t get brittle even when exposed to harsh conditions. Even if you bring it from one cold place, and then use it on a hot location the next, it won’t crack up. It has a hot orange color that makes it hard to miss, but I noticed that the color fades over time, like after a couple of years. I would recommend using the cap on the top layer when using this for the jack so that the protruding interlockers won’t get mashed or bent out of shape. But it still a heavy-duty leveling tile that can easily last for more than 10 years, which is probably why the warranty is that long. All in all, I love the Lynx Leveler and it is definitely one of my preferences. Plus it’s right within budget. One of the most intuitive levelers you’ll ever see, Andersen Camper Leveler is easily one of my favorites. This leveler has a curved design, with increasing thickness that allows you to just drive up to the height that you want to achieve. Using this leveler is easy enough; all you have to do is determine the height you want to achieve, drive to the leveler and stop to the point of the height, and then add the coupled wheel chock. Voila! You’re done. However, unlike other levelers which you can set on your own, you would need another person to guide you to stop just at the right point and place the corresponding wheel block immediately. What I love about the Anderson leveling blocks is that it also acts as a stabilizer. Its unique design is to thank for that. You can literally set it up in five minutes or less. However, it can only adjust the level for up to four inches; anything more than that and you’ll need some tile levelers. If your axle is too close to each other, you can easily trim this leveler to make it fit. Specific instructions on how to trim are included in the set, so make sure you follow them to prevent any breakage. If in case your Anderson levelers get broken, you can have them replaced if it is still within the 3-year warranty. One of the things I don’t like about this leveler is that it can only hold trailers with tires of up to 32 inches. If your tires’ size is bigger, don’t use this. Bigger tires don’t fit the curve of the leveler perfectly, which causes a space in the middle. This means the pressure will be on the edges of the curved leveler. This can cause the thinner part to eventually break off. The company recommends trimming a portion of the leveler so that the tire can come in contact with the surface of the leveler in full. But I would advise against that because you would have a lot of measuring to do. And what if you broke off too much? Finally, I notice that sometimes it would slip and be a bit hard to install on wet surfaces or really smooth surfaces. What I did was place a rubber mat underneath to add traction and I was able to set it up easily. Camco is really in it to win it in the RV tools space. Aside from their modular leveler, they have this Tri-leveler that you can just set down and roll on to level your RV. It has three different height levels: 1.3 inches, 2.6 inches, and 3.9 inches. If you need more than 3 7/8 inches of height, you would need to use an additional leveling tile underneath, or you should switch to a different leveler altogether. 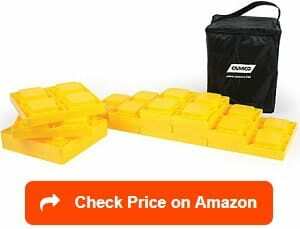 Camco leveling blocks are made of high-quality resin, which makes it durable for any weather. However, it can only support up to 3,500 pounds per wheel. It has a non-slip surface, but for safety purposes, I still use a chock to make sure my RV won’t roll off. If you are using tandem wheels, I will not recommend this Tri-leveler. I have heard other people try it by using it only on the front wheel or the back wheel. Although it provides the level needed, it doesn’t provide a more stable set-up. You can add a chock, but I would prefer the Camco modular blocks for dual axles. I like that this leveler works great on gravel and rocky ground. You wouldn’t have to worry about rocks wedging underneath or breaking the material. It also has a handle on the front face which is great for easier installation and removal. One downside is that it tends to slip on asphalt or on smooth surfaces. What I do and would recommend is buying a rubber mat to place underneath to add traction. Apart from that, it works as smooth as silk. If only it had higher levels, then this would be the perfect leveler for me. Another one from Camco, the Fasten Leveling blocks are actually what I would recommend for people who own RVs with dual tires. The 4×2 leveling blocks are really wide, with 17 inches on the side to easily roll over your dual ties without having two sets of leveling blocks. I love its convenient carrying handle that you can just slip through the middle, twist a little to tighten the screw and voila! You can store it away. Other leveling blocks have flimsy plastic zippered bags which easily break, leaving you to find a different way to store your levelers. Like other Camco leveling blocks, Fasten 4×2 is made of UV-treated resin so it won’t easily break even under harsh conditions. I believe this is the best RV leveling blocks dual wheels as you can also use is with trailer tongues and 5th wheel jacks, which can be a hassle to adjust on smaller sized leveling blocks. Setting up is simple enough, although not as easy as the Camco Tri-leveler or the Anderson Camper Leveler. Like regular interlocking leveling blocks, you just need to make a staircase for your wheels to easily climb and settle on. You can stack it up to 4.5 inches. Anything over that and you need to move to a better parking spot. It comes in two colors: dark brown and yellow. If you don’t want your leveler to be too obvious and you want it to blend with the environment, get the brown one. I prefer the yellow one, though, as it’s very noticeable that you won’t forget it and leave it behind. One drawback is that the top is not smooth enough for your tires. Your tires will rest on the squares of the honeycomb design, which can put undue stress on your wheels. I would recommend getting the filler caps, which are sold separately. It would have been great if the caps are already included in the set. One of the most expensive leveler blocks in the market today, Quality Plastics Utility Block lives up to its name though: Quality. One look and you’ll know it’s durable and will last you a really long time. Not only will this work as a leveler, they can be used for almost everything else such as driveway paver or stabilizers. These are made of really thick rubber, except that it doesn’t have the awful smell that some chocks have, which is great. Since it’s made of rubber, it creates traction on the ground and against each other, so there’s very little slippage which I very much appreciate. The best thing I like about this utility blocks RV leveling is that it can take up to any weight. 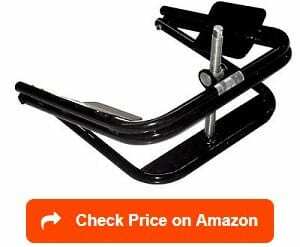 They are very solid and you can use them not just for your tires but your jacks as well. It can work on any surface: pavement, gravel, soft ground, and whatever uneven surface you park on. It doesn’t sink on soft ground, which is great. It’s definitely amazing! You can set the level by stacking them up as stairs like the interlocking leveling blocks. The only drawback is that the groove at the top is a bit small unlike other interlocking tiles, but it works so I have no complaints. These rubber leveling blocks don’t crack as others do as they are pretty solid inside. It’s also great for any weather: whether you’re visiting somewhere really cold or camping somewhere really hot, Quality Plastics can withstand any weather without breaking. It has a cord on each block, which makes it easier for carrying and storage. Very similar to the Tri-leveler, the OxGord Leveler Ramp is a drive-on incline. It has three levels for you to choose from. You just need to know how much height you need, then drive on the RV leveling ramps. If you want less fiddling around, this works so much better than regular leveler blocks. Although these ramps are lightweight, it can carry a great load. Each ramp can carry as much as 11,000 lbs per axle. However, if you have dual or even triple axles, these ramps may be too long and may not fit between your tires. Some tried cutting the ramp in order to fit dual axles, but I wouldn’t recommend doing that as I believe it will compromise the integrity of the RV tool. The only drawback is that it doesn’t work well on rocky surfaces or those with gravel. The edges at the bottom easily bend and get chewed up. Upon using this on gravel, spider cracks started to appear. It has a non-slip surface so driving up to it won’t cause it to pop out while setting up. However, make sure to roll all the way to the level you want, because the wheel tends to slide on the ramps a bit, even when on break so I sometimes use a wheel chock just at the safe side. Although the ramp’s height is 5 inches, it can only level up to 3.8 inches. It raises levels in increments of 1.25 inches, so you won’t have to set up block by block. Also, I would recommend using a rubber mat under the ramp in order to prevent it from slipping when setting it up. If you have a dual or triple axle RV, then you are no doubt looking for the perfect leveler without having to cut what you currently have, eventually compromising the integrity of the material. You need not search any further because the Bunkerwall Tandem Axle ramp is perfect for your needs. I actually love this dual wheel leveling blocks compared with others. The Bunkerwall ramp is comprised of two parts that can be easily interlocked. If your tires are too close to each other, you can simply remove the higher block and use the lower ramps. You can use the full ramp on the front tire and half ramp on the back tire. You need not worry about compromising the material, as it’s still very stable with or without the back part. However, the highest part of the leveling is four inches. If you remove the highest part, the highest level is around three inches. If you need a higher level, you can attach the back part upon driving to the highest portion of the front part, then place the back in between the tires. But if your tires are too close to each other, it might not fit. The back part is actually 8 and a half inches long so your dual tires need to at least be that far for it to fit. The interlocking links allow you to easily nudge it down. If you need a higher level and the back part doesn’t fit, I would suggest using a leveling block underneath. However, this also means you need more than yourself in setting your leveler up. If you’ll be doing it on your own, it will take more than a few minutes to level your vehicle. You need to drive up to the highest point of the front level, put on the brake and go down to place the back part, then go back up to drive all the way to the highest point of the ramp. I like that it’s made of thick high-density polyethylene, which can carry a maximum of 10,000 lbs per axle. I also like that it’s colored black for the front part and red for the back part. It’s less conspicuous than the yellow leveling tiles. These stacker levelers are one of the best levelers in this list. Instead of the regular four grooves, this one has 16 smaller grooves. It allows you to easily stack it up as stairs and it connects better. It also has a molded handle which can also work as a transition to the next level. I like that it’s very compact. Instead of the usual bag for the leveler blocks, it has a Velcro string that ties the tiles up nicely together when you need to store it away. It’s a tuck it and store it system, which is good for me. It works great for my RV, although gravel and dirt easily get wedged in the spaces underneath. My solution was to turn them over and use them inverted. It worked great! This way, it doesn’t get stuff between its holes and it doesn’t crack easily. Although of course, that’s not how it was designed. If you want to prevent gravel from getting picked up, I would recommend placing plywood or a rubber mat underneath, as I always say. The same goes for when you’ll be using this in muddy areas of it there’s a chance of rain. If it rains and the leveler is set on dirt, there’s a chance that the leveler will sink in the mud. Better place plywood underneath to prevent this from happening. The Valterra Stacker’s material is thicker and heavier than other levelers, which I believe contributes to its durability. 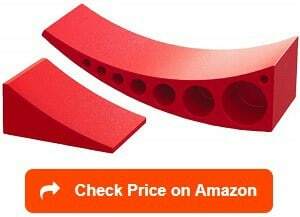 If you have dual axles, it would be best to get two sets of these to properly level your motorhome, although they are a bit more costly than other leveling tiles. I consider this set to be class A RV leveling blocks. If you own a single axle, lightweight RV, I would recommend you use the BAL 28050 leveler. This is so much easier to use than RV leveling pads as there is no need to stack and remove blocks to adjust the height of the leveler. This leveler is made up of black stainless steel bars that are locked against each other. It has a large steel screw that helps adjust the height. Practically, you just lodge the tool against the tire you want to level, then use the ratchet included in the set to crank it up. However, although it may seem like it functions like a jack, don’t use it as a jack or the threads on the screw will easily deform! It would be best to use a jack to raise your camper, slide this leveler into position, then adjust its bar height for it to fit snug against the wheel at the perfect level. Make sure to maintain the worm screw by using heavy grease or lubricating oil. This will prevent any foreign debris from damaging the screw and stop any rusting from happening. The grease can make the set messy, so it would be best to store it in a separate bag. I like that this works wonders for lightweight RVs and pop-up campers, but it can’t be used on heavier RVs. The tire leveler can only hold up to 1,500 lbs per axle. Also, it can only be used on small sized wheels such as 13-inch, 14-inch and 15-inch tires. If your wheels go over that, better use the leveling blocks instead. 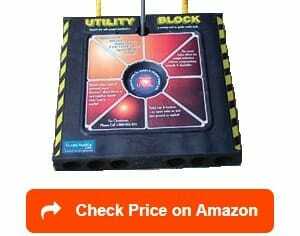 This leveler is more expensive than RV utility blocks, but it is so easy to use. Plus it works as a stabilizer too. Too bad the company couldn’t make anything like this for bigger wheels and heavier RVs. The following are the qualities you need to look into when buying an RV leveling block set. Durability – being durable is necessary. You wouldn’t want your leveler to suddenly crack and split while being used, causing your RV to shift to one side. It can even be more problematic while you are inside and doing something, such as cooking, when this happens. Think about the possible accidents that can happen both inside and outside of your RV when the blocks break. Your food might get spilled, someone might hit his head, your RV’s frame can break. These are just some of the possibilities when your leveling block fails. If you travel to areas with extreme climate conditions, such as the Las Vegas desert that has really cold nights and really hot days, your leveling block must be able to withstand the change in temperature. My number one rule when checking for durability is finding out about its warranty. I believe that the more confident a manufacturer is about his product, the better are his warranty offerings. Maximum weight – not all leveling blocks can handle any type of weight. Some, like the BAL 28050 Leveler, can only hold lightweight campers. It can hold a maximum of 1,500 lbs only. There are also those that can hold really heavy RVs, such as the Quality Plastics blocks and the Lynx RV Leveling blocks. The Lynx blocks can hold up to 40,000 lbs, while the Quality Plastics can manage even more than that. Make sure to know how much your camper weighs, with and without additional stuff inside. Keep this number in mind when buying a leveler so you won’t end up with a broken leveler that cannot be replaced because you did not know it can break under too much load. Ease of Use – how easy is it to install? If you can manage to set your leveler up even when you’re alone, all the better. If you only need to measure the height you need, drive on your leveler and everything’s good, then that’s perfect. It’s also an advantage if the leveler is easy to clean and store away. Price – this is one of the major concerns of any camper. The perfect balance between ease of use, durability, and price must be achieved when buying a leveler. 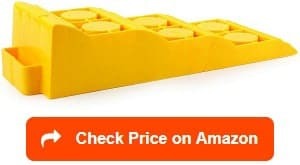 Some leveler blocks are more expensive because it’s a name brand, or because it has extended warranty, or it could be because it has additional features. What is an RV leveling block? As its name implies, an RV leveling block adjusts the height of a specific part of your RV to make sure the inside of your RV is horizontally aligned. This is important to make sure the appliances inside your RV work without issue, and that you will not slip and slide while you’re inside. Some RV appliances will not work if they are tilted, such as an RV refrigerator. And even if your refrigerator works in a slanting position, it may get damaged and might cease to work in the future. 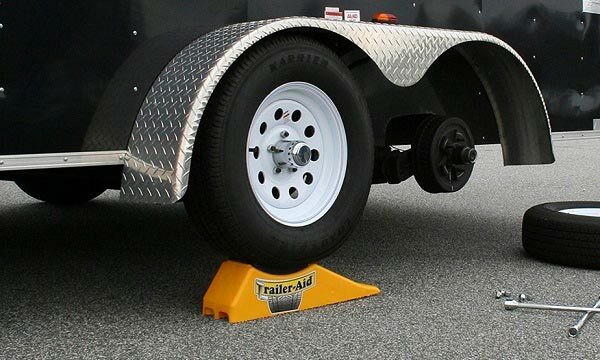 Although jacks can be used to adjust the height of one side of your RV, it should not be used as a leveler. Jacks cannot support the weight of a motorhome for a long time and might cause accidents. If you use a jack to level your RV, you might end up not only breaking your jack, but also the RV frame. There are two main types of RV leveling blocks, and these are the interlocking leveling blocks and the leveling ramps. Interlocking blocks are made up of square plastic tiles that look like large versions of Lego. You would need to stack them up like stairs, with the highest point as the height of adjustment that you need. Each block is usually an inch or two in height, but when stacked against each other will only increase the height in increments of half an inch to one inch. Ramp leveling blocks, on the other hand, need not be stacked. They are already molded as stairs, with each level having a fixed height. 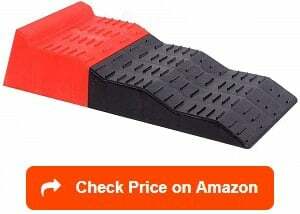 A common issue with ramp levelers is that it tends to slip and slide when you drive on them. This can be solved by adding a rubber mat under the ramp, and by chocking the wheel once you have leveled your RV. There is some new technology being used today for leveling, two of which are inflatable levelers and electric levelers. 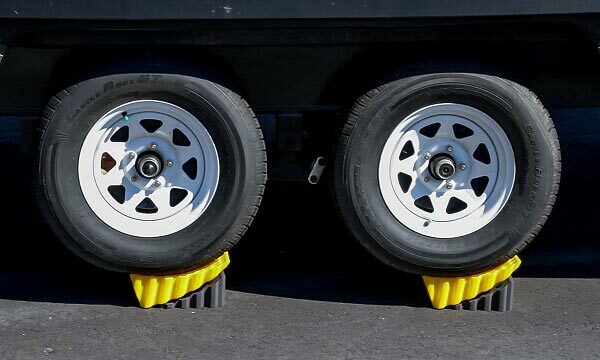 Inflatable RV levelers are flat bags placed under the wheel to be leveled. Air is then pumped to it using a tire inflator pump until it reaches the desired height. It is an easy enough process, although many RVers dislike its use because it makes their camper wobbly and unstable, which can cause issues on the tire suspension. It would work well if the maximum inflatable height is used as the bag would then be tight enough to prevent wobbling, but if you need any lesser than that, you will get the “waterbed effect”. If you have the budget and would like your RV leveled with just a push of a button, then you can always install electric RV leveling jacks. These are very intuitive and will be able to level your RV with minimal intervention from you. They do, however, cost a pretty penny. A complete electric leveling system with four legs installed strategically in your RV will cost you a minimum of $2,000. And that’s just the device; this price does not include the installation. This is why the good old fashioned way of adding leveling blocks under the tires are good enough for me. Are RV leveling blocks necessary for you? If your RV doesn’t go with its own leveling system, then RV leveling blocks are a must-have. Whether you go to well-known camping grounds or you only frequent unexplored campsites, you would surely need to adjust the height of your camper. You can’t just rely on the possibility of rocks and wood being present at the campsite. You can also make your own leveling blocks for camper, with the help of a few chunks of wood and even some planks. But you cannot count on their durability, and how long they will last you. I would also recommend having leveling blocks ready for emergencies, even if you already have RV leveling systems installed in your camper. If your electric system doesn’t work, it’s nice to have a backup. 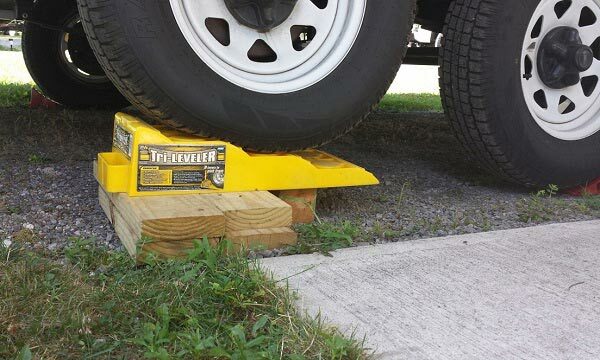 RV leveling blocks work by adding height to your wheels when they are placed on the ground. Typically, you drive over the blocks to achieve the right level. RV leveling blocks can be stacked on top of each other to achieve the desired height. Some RV levelers can also be ramps that you can easily drive up on, with each step an increment of an inch or so. How to make RV leveling blocks? If you have some spare lumber lying around, making your own leveling blocks can be easy, not to mention cheap. The standard size of leveling blocks is between 8 to 10 inches per side. The thickness should be from one to two inches. The first step is to simply cut-off one inch or two-inch thick planks to your desired size (again, 8 to 10 inches per side). Then attach a screw eyelet on one side. Tie a rope or string through the eyelet. 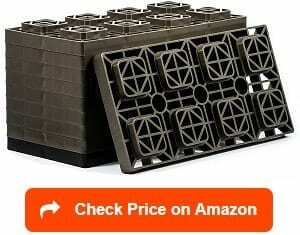 This makes it easier to pull and store your homemade leveling blocks. How to use RV leveling blocks? 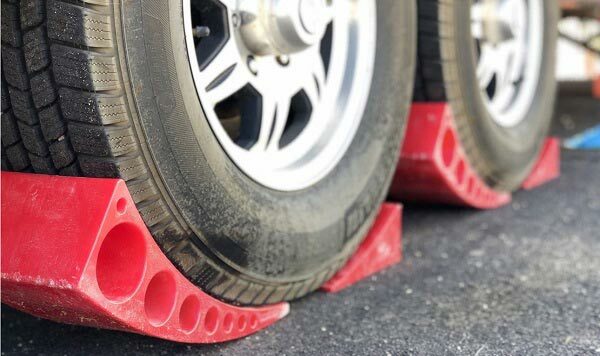 As mentioned in how RV leveling blocks work, you simply lay the blocks down on the spot where your wheel should be. You would need to stack them up according to the height that properly levels your RV. If you have leveler ramps, you just need to set them down, no need to stack them up. Then drive your wheel on top of them and you’re set. 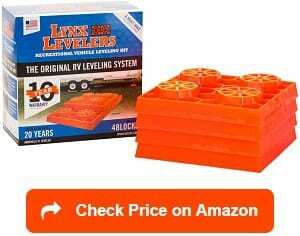 How many RV leveling blocks do you need? Single-axle RVs typically need only one set (10 blocks per set or one leveler ramp). If you have tandem wheels, then you would usually need two sets, except when you get the Camco Fasten 4×2 levelers which are wide enough to accommodate tandem wheels. However, having an extra set would be useful if you need to level the front and back wheels of one side, or you need to level both sides at the back. So to be on the safe side, you should get at least two sets. If you are handy and like doing things on your own, DIY leveling blocks can work for you. But remember to think of safety first. If you cannot guarantee that your homemade blocks are strong enough to hold your RV, it would be best to get professionally made ones. Trust me; the best RV leveling blocks are worth the money you spend on them. We would like to thank you for reading this article. Find out more about how to choose the best RV tires and best trailer tires with our reviews and ratings. Furthermore, please take a look at the best RV air compressors and best RV wheel chocks to choose the right one for your RV Tires & Accessories.